Ever wonder why people seem to think you have endless amounts of time to do whatever they want you to do? You know those situations where they ask you to help out on a project, or attend one more meeting, or even give up your Saturday to help them move? Like you, I realize time is one of the most important non-renewable resources in this life. You can always make more money. You can never make more time. That’s why I created the High Impact Leader Course. It’s designed to help you get time, energy and priorities working in your favor instead of against you. To make sure you don’t miss out the next time registration for the High Impact Leader opens, join the wait list. 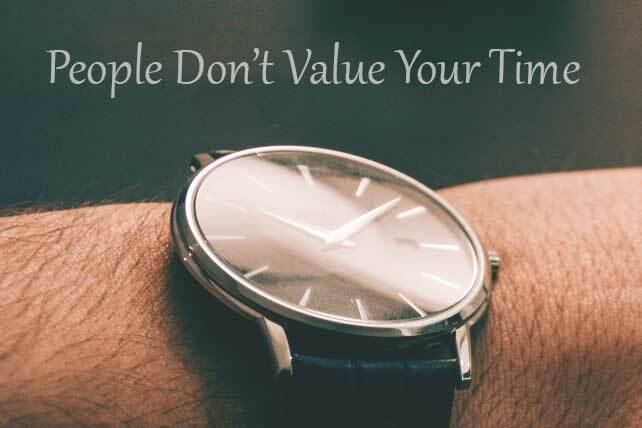 So why is it that other people don’t value your time? You’d be surprised. It has a lot less to do with them and more to do with you. In fact, as I figured out the answers to that question, it really opened my eyes to why things were happening—and not happening—in my leadership. Here are five reasons other people don’t value your time. So why do people not seem to value your time? Other people value your time exactly as you value it. The main reason people don’t value your time is because you don’t value your time. This is not an easy lesson as a leader. But early on when I was really struggling with my time, it dawned on me that the main reason people didn’t value my time is because I didn’t value my time. Think about it for a minute. Take yourself out of the picture and think about the leaders you know. You know leaders who don’t seem to value their time at all. Interestingly, these same leaders end up in meetings in which the person they’re meeting with shows up late or cancels last minute. They’re not good at hitting deadlines and they have trouble getting other people to hit deadlines or do what the team needs them to do. While there are a myriad of issues underneath that, one of the key factors is simply this: if you don’t value your time, why should others? Others value your time exactly as you do. Contrast that with the habits of other people I know who really value their time. They’ve prioritized who they meet with, and while you might get some time at the water cooler with them to catch up, not everybody gets meaningful slices of their time. And that’s intentional. If you have a conference call or arrange to meet up with them at 3 p.m., the meeting begins at 3 p.m.…and often they’re online a minute before. In addition, they’ve likely spent some time prior to that prepping for the call. They hit deadlines. They organize almost every hour of the day to get the most out of it, including down time and time with family. Sure, they might struggle from time to time with keeping all their tasks on schedule, but when you look at their capacity and output, it is staggering compared to others. Someone who places a value on their time also inspires others when it comes to meetings and not being late for them. When you get an hour with them, you value it. Because they value their time, others do. Others value your time exactly as you do. If you value it, so will other people. If you don’t have a plan for your week before it begins, you’ve planned to fail. Leaders who value their time always start with a plan for the week before it begins. I actually have a fixed calendar I live by. When I’m not travelling, I have a very similar week every week. Days for meetings. Days without meetings. Productive windows I reserve for writing. I show you how to set up your own fixed calendar in the High Impact Leader course. Your pattern will vary, but the key is this: Have a plan for your week before other people plan it for you. As your life gets busier, one of the most important shifts you can make as a leader is to stop just thinking about people and start thinking about ‘kinds’ of people. I’m not talking about stereotypes at all, but I am talking about the role that people play in your life and leadership. You won’t have time to meet with everyone, so you need to figure out in advance who you’ll meet with. That’s where the ‘kinds’ of people distinction helps. For example, as your church grows, you might realize you can’t meet with everyone so instead you’ll meet with volunteers. Then your church grows and maybe you discover that you now have hundreds of volunteers and that category no longer works. So you decide you’ll spend your meeting time with people who lead your volunteers. The leaders who lead with the highest impact have discovered one other secret: Make most of your meetings with the people who give you 80 percent of your results. Spend 80 percent of your time with people who give you 80 percent of your results and stand back and be amazed at what happens. Regardless, if you haven’t decided ahead of time the kinds of people you’ll meet with, you’re sunk. Ever sit in a meeting and wonder…why are we meeting? Ever lead one of those meetings? Yep, we’ve all been victims and most of us have been guilty of calling one or two of those in our lives. If you really don’t want people to value your time, have no clear goal in mind when you call a meeting. If you can’t articulate the goal of a meeting you called, be assured that no one else can, either. Ditto for inefficient meetings and ineffective meetings. The same goes for conversations. It’s always good to connect relationally, but if there’s no direct purpose in the conversations you’re having, people will come to devalue your time. So you set two hours aside to move some freight, and at the end of it, you’ve got nothing to show for it. Sure, you played Whac-A-Mole with your email (hit one and two more popped up while you were answering the first one), checked Instagram and Facebook, clicked on all the Twitter links and played with some snap-chat filters and buzzed around that big project, but nothing is completed and nothing can really be checked off. That’s the problem with office work. Unlike an assembly line, there’s no car door coming off the line every four minutes that you have to attach or you get fired. Sure, if you do social media instead of your job enough times, you may get fired. But a far more likely scenario is that you get your job done. You just get it done later. Like at night. Or on weekends. Or on your day off. It’s one more sign you don’t value your time, and until that changes, others won’t respect your time either. I have spent a good chunk of the last decade rebooting how I spend my time energy and priorities to accomplish far more than, honestly, I ever imagined was possible. In addition to founding Connexus Church, which nine years into its existence is home to more than 2,500 mainly previously unchurched people, I’ve found renewed time and energy for my family, launched this blog and two podcasts, written three books and I speak to thousands of church leaders around the world each year. Your story will be different, of course, but if you struggle to organize your time, energy and priorities to realize your capacity as a leader at work and in life, the High Impact Leader Course can help. Share a clear, 10-step strategy to lead with much higher impact at work and with higher impact in life and at home by getting time, energy and priorities working in your favor. Show you how to get out of meetings you don’t need to be in or want to be in. Explain why passion, not balance, is a key to finding your highest level of impact in life and leadership. Explain how to spend most of your time with the leaders who produce most of your results and minimize time with those who don’t. Get your first priorities done early in the week and early in the day so your time off is actually time off. Outline a six-step strategy on how to say no nicely so you can finally control your calendar rather than having other people control it for you. And that’s just the beginning. The High Impact Leader is designed to help you completely revamp your life and leadership. The High Impact Leader disappears tonight at this price. In fact, the course entirely disappears after tonight. And when we bring the course back at New Year’s, it won’t be at this price. Many have said 2016 was a hard year for many reasons—I am convinced 2017 can be a game-changer for you if you’re willing to change some of the things you’re doing so you are placing a much higher value on your time. So what are you learning on this? Had any eye-opening moments yourself? Next articleSanta Claus: Harmless Fun or Christmastime Diversion?